Discover many of Moscow’s top sights in just half a day on this two-for-one tour. Meet your guide directly at your Moscow hotel, and set off on a quick tour of several city highlights. 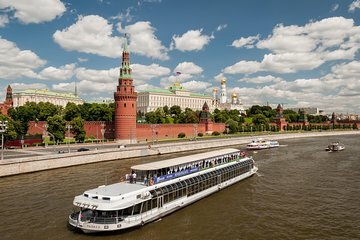 Next, embark on a sightseeing cruise along the Moskva River. See landmarks ranging from the Cathedral of Christ the Savior and the Moscow Kremlin to the Novodevichy Convent. As you go, you’ll learn more about the city’s history from live, on-board commentary. You’ll also enjoy a three-course Russian meal, plus wine.